[LOWELL, MA] – Outdoor farmers’ market season is in full swing in the City of Lowell! Seasonal, locally grown produce is available 5 days a week via Mill City Grows’ (MCG) Mobile Market, a “Farmers’ Market on Wheels,” which makes stops at 11 citywide locations, including 9 outdoor sites and 2 indoor sites. Staffed by Mill City Grows; team members and youth participating in MCG’s J-Squad Program, the Markets are stocked with seasonal fruits and vegetables grown at the organization’s three Lowell farm sites: the Urban Farm at Mill No. 5, the Urban Agriculture Greenhouse at UMass Lowell, and MCG’s “Big Farm” in Pawtucketville. All Mobile Market sites accept cash, credit card, check, SNAP, WIC, and Senior Coupons for payment. Mill City Grows also participates in the State’s Healthy Incentives Program (HIP) which provides a dollar-for-dollar match of SNAP recipients’ purchases of local fruits and vegetables. Launched in June 2014, Mill City Grows’ Mobile Market Program strives to fulfill the organization’s mission to make healthy, locally produced, affordable food available to all Lowell families, especially to those with little to no access to fresh food. Recent data shows that Lowell’s poverty rate is 19.1% higher than the state average, and 22% of residents use food subsidies. Many residents shop at convenience stores with limited, low quality, and high cost produce, as they cannot walk to a grocery store or afford cab fare. As of October 1, 2017, cost of living allowance (COLA) adjustments reduced SNAP allotments for over 200,000 state residents. This has greatly reduced the food budgets of many older adults, who often have smaller household sizes and tend to purchase shelf stable items that are higher in sodium and sugar. Mill City Grows’ Mobile Market prices and convenient locations offer elders the opportunity to purchase smaller portions at prices that are within their budget. Harvard Pilgrim Health Care Foundation, one of Mill City Grows’ Mobile Market original funders, has provided $180,000 in grants over the past three years as part of its Healthy Food Fund to help expand healthy food access, especially for the city’s older residents. 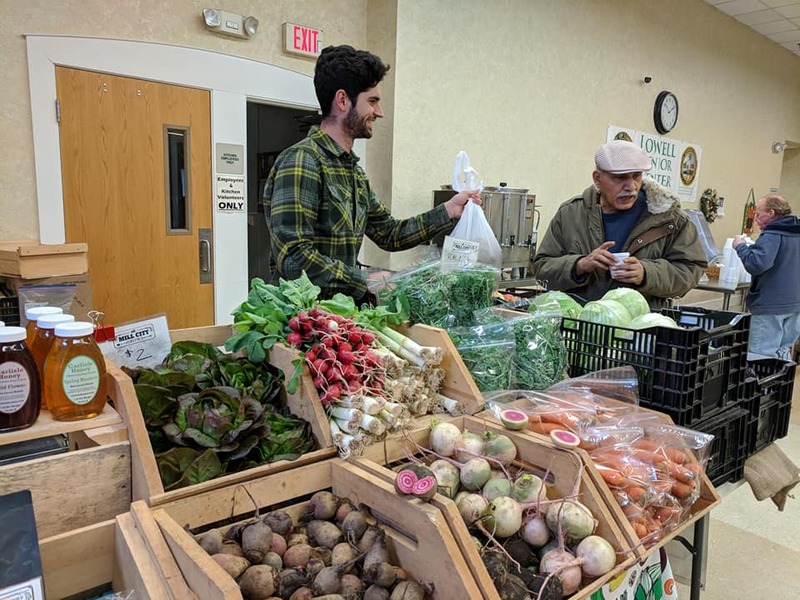 The new Lowell Senior Center Market, one of MCG’s two indoor Markets, has been a catalyst in meeting the shopping needs of older residents, many of whom are SNAP recipients who also benefit from the Healthy Incentives Program. SNAP purchases and the demand for freshly grown food have steadily increased since the start of the Healthy Incentives Program in April 2017, as many seniors and economically disadvantaged families continue to utilize the benefit to increase the amount of produce they take home. Kim adds that the Mobile Market is making strides in taking customer recommendations into account in terms of providing a more diverse selection of produce that reflects its customer base. Lemon Grass, Thai Eggplant, Garden Egg, Dried Beans, Long Beans, Husk Cherries, and Bok Choi are just a few examples of these unique crops that have been made available. As someone who was raised in an immigrant family that struggled to make healthy food a priority, Kim is sensitive to the needs of many of his Market clients. Mill City Grows’ Mobile Market Program is supported in part by grant funds from the following organizations: American Heart Association, Greater Lowell Community Foundation, Harvard Pilgrim Health Care Foundation, Lahey Health, Massachusetts Attorney General, Tufts Health Plan Foundation, USDA NIFA Community Food Projects. Additional support is provided by the following sponsors: Circle Health, Element Care, Enterprise Bank, O’Connor Portraiture, Tufts Health Plan Foundation. The public is invited to follow the Mobile Market on Facebook for daily updates on product availability and market stops. Below is Mill City Grows’ Mobile Market Schedule, through November 2, 2018. A printable schedule can be accessed here. Lowell Community Health Center, 161 Jackson Street, 11 a.m. to 2p.m. Riverplace Towers, 1 River Place, 3 to 5 p.m.
Butler Middle School, 1140 Gorham Street, 2 to 4 p.m.
Eagle Park, 92 Jewett Street, 11:30 a.m. to 1:30 p.m.
D’Youville Life & Wellness Center, 981 Varnum Avenue, 2:30 to 4:30 p.m.
Lowell General Hospital (Main), 295 Varnum Avenue, 11 a.m. to 1 p.m.
Lowell General Hospital (Saints), 1 Hospital Drive, 11 a.m. to 1 p.m.
McAvinnue Elementary School, 131 Mammoth Road & 4th Avenue, 2 to 4 p.m.
Lowell Senior Center, 276 Broadway Street, 2 to 4 p.m.
CTI Lowell Farmers’ Market at Lucy Larcom Park, 258 Merrimack Street, 12 to 5 p.m. The Farm Market at Mill No. 5, 250 Jackson Street, 4th Floor, 11 a.m. to 3 p.m. Since 2011, Mill City Grows has worked towards food justice in Lowell, Massachusetts, using the following strategies and programs: education in and out of schools, supporting community leadership through community gardens, increasing urban agriculture through urban farming, implementing a mobile market, and empowering people to produce their own food. Their Food Access and Food Education programs are rooted in the idea that a well-educated and well-resourced community will make healthier choices. Visit MillCityGrows.org to learn more, or follow them on Instagram, Twitter or Facebook.